The first pancakes I ever ate were Swedish pancakes made by my Scandinavian mother and grandmother. Every October when my dad and his buddy went off duck hunting for the weekend, we would have a pancake feast. Swedish pancakes are big thin eggy things that we slathered with lots of butter and sugar, and folded in quarters. The butter melted and formed this buttery, sugary syrup that dripped all over. So good. I grew up in Minneapolis and pancakes played a big role in the tall tales told about the famous Minnesota lumberjack folk hero, Paul Bunyan. It seems Paul’s kitchen covered about ten miles of territory in the north woods. His stove was an acre long, taller than a pine tree and when fired up it melted the snow for 20 miles around. The way I heard it told, Paul could eat 50 pancakes a minute. Yep, I grew up on these stories. In fact, I think it was in third grade, we did a big mural about giant Paul Bunyan and Babe, his blue ox, which included those big pancakes. I have been thinking about all the forms of pancakes I have eaten in my life, and you know what, there are quite a few. Hotcakes, griddlecakes, flapjacks, johnnycakes. Crepes filled with creamy seafood or bananas and caramel sauce. Buckwheat blini with smoked salmon and crème fraiche. Blintzes with ricotta and strawberry jam. Latkes with butter and apple sauce. I think every culture and cuisine on the planet has a savory and sweet version of the pancake. And who has not eaten at an IHOP at least once in their life. So here is one of my renditions of the pancake, made with plain yogurt and currants. I like the way they stay thick and substantial. And next time I make these to photograph, I’m going to freeze the syrup so it drips languidly down the side in food styling grandeur. Thank you, Denise. 1. Whisk together flour, cornmeal, sugar, baking powder, baking soda and salt in a large bowl, then stir in the currants. 3. Heat a lightly greased large nonstick skillet over moderately low heat until hot. Pour ¼-cup measures of batter into skillet in batches, forming 3 ½-inch cakes. Cook about 3 minutes until golden, then turn and cook 1 more minute, or until golden. 4. Keep warm in 250 degree oven if desired while cooking remaining cakes. 5. Serve griddle cakes with warm syrup. I loved reading about the food styling workshop you did. It was really interesting. And loved the syrup idea. Wish I had known that trick a couple of posts ago! Will try these next time as I love cornmeal. p.s. I love those old stories about Paul Bunyan. I have never made pancakes with cornmeal before, which needs to change! I am such a fan of flapjacks, and I’m always trying to find ways to make them a bit more exciting. Thank you for sharing with us…and your photo with the print in the background is just great! now thats a great pancake recipe! Cornmeal and yogurt must have made them taste so good! I would love to try them! Oh, cornmeal pancakes are sort of an addiction of mine! Love the addition of currants! I would definitely go with the brandy for soaking the currants!! Pancakes do seem to be a rather universal food – great list of all the different kinds!! Like the syrup idea – going to have to play with that one!! Oh perfect! 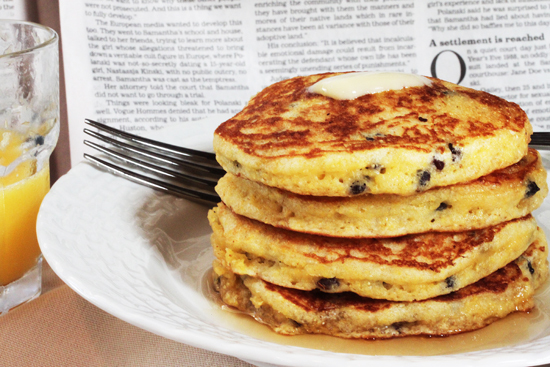 I adore pancakes. Along with sandwiches, they rank among the world’s most perfect foods. Yours look amazing. I love the addition of currants and yogurt. They look thick and fluffy at the same time! HOLY FREAKING CAKES! Those are, most definitely, the most tantalizing pancakes I’ve ever seen! I LOVE cornbread, or anything made with cornmeal, and I love the natural tang from the yogurt in here, and the lovely currants…oh lordie. I’m just about to tear apart my laptop screen from lust! Hmm..this looks delicious! I love currants–did you use real or Zante? I love cornmeal too and using yogurt in pancakes. When I’m looking for a new take on a standard, I always google the ingredient(s) I have and the item I want to make. I found your recipe through a search for “currant pancakes.” I just had to write to tell you that these were pure awesomeness and a major hit with my family of pancake connoisseurs (translation: my pancake-loving children were over the moon with these). I think this is the way we’ll be making pancakes from now on!